Ma Labour-supportin freends – the yins wha hivnae awready gave up on me – are ayeweys bangin on aboot Neil Findlay. If it’s real chynge ah’m wantin tae see in the warld, proper socialism, forget the SNP, they tell me; Neil Findlay is the man for me. The moral coonterwecht tae the political careerists even they admit hiv got the Labour pairty bi the scruff o the neck. It’s Neil Findlay this, Neil Findlay that. Like coffee, like Breaking Bad, ah want tae like Neil Findlay, if anely tae fit in wi aabody else. Gin the wirkin-clesses hae got a real freend in the chaumer at Holyrood, ah’d want tae be a freend o his. Sae it really sticks in ma craw tae read some o the havers he cams oot wi on Twitter. 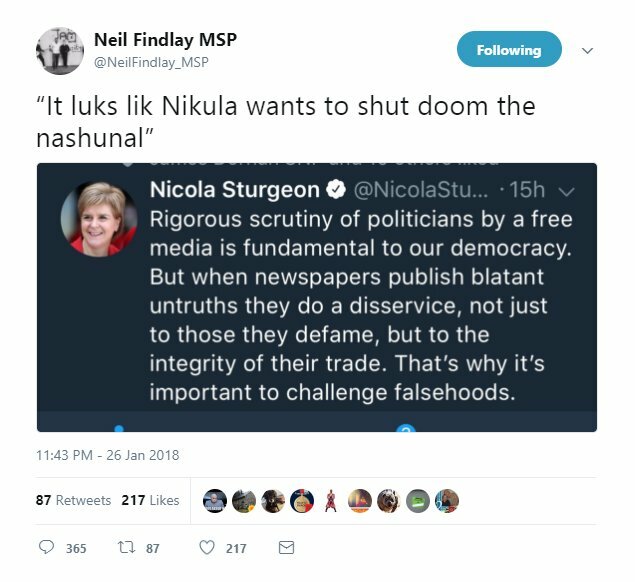 The day, for instance: for nae reason at aw, in a stooshie that’s got nowt tae dae wi us, Findlay gans an taks the piss oot o Scots speakers in a tweet aboot Nicola Sturgeon’s war on fake news. “It luks lik Nikula wants tae shut doom the nashunal,” he says, twa-three screen centimetres awa fae a banner endorsing Labour as the pairty o SOLIDARITY an EQUALITY. Mebbe they’re the pairty o IRONY as weel. Ah dinnae ken. But that wee tweet? That’s whit ye’re gettin yer knickers in a twist aboot? It’s jist a joke, like. Jist casual. Jist a wee thrawawa comment, aff the tap o the loun’s heid. Dry yer een, wee man. Dinnae tak it tae hert. Weel, aye. Nae dout Mr. Findlay says things like this aw the time an thinks nothin mair tae it. Nae dout Mr. Findlay wad be awfy sorry tae hear that he’d upset somebody – ah jalouse we’ll fund oot if an when he apologises. An nae dout Mr. Findlay’s respect for Scots an Scots speakers is blah blah blah. Ma guid feres Matthew Fitt an Alistair Heather hae been cawin the Scottish Government tae accoont lately for their lack o action on the subject o Scots. But amangst the mony reasons that there’s nae political imperative for the government tae mak a muive on this is that there’s nae ither pairty wants tae dae onythin for Scots either, or even tae let on they micht. Scottish Labour get a free pass on the subject o indigenous leids time an time again on accoont o their previous efforts on behauf o Gaelic. But when it cams tae Scots, they’ve been as bad as ony, an afttimes warse. Tak their maist recent manifesto included a wishy-washy paragraph aboot leukin efter Scotland’s ‘rich cultural heritage’, which lumped Gaelic an Scots in wi the apparently fictional language o ‘Nordic’. Wi supporter like that, whit’s a Scots speaker tae dae but pit his heavy buits on an get back intae the sea? A thing we dinnae talk aboot in regaird tae Scots, acause it’s no politic an mebbe gets us naewhaur, is that it’s the leid o the wirkin clesses. No exclusively, like. But gin a bairn is growin up in poverty in this kintrae, like plenty o thaim are, ye can bet a pound tae a penny it’s Scots they’re growin up speakin, an like as no gettin telt aff for speakin. Weans that hae pickle tae feel prood aboot themsels for as it is, an they’re makkit tae feel they’re stupit the meenit they open their mooths. That’s a tragedy, no something tae laugh aboot. Neil Findlay, freend tae the wirkin clesses – aye, an we’ve had plenty o freends like him. Freends wha ding ye doun, mak ye feel ye cannae dae ony better, convince ye that naebody else even likes ye. Freends wha tak the piss an twist the knife aw at yinst, an laugh at ye for no bein in on the joke. Freends wha dinnae like you, or onybody, or even theirsels. Cheers, Neil. Wi freends like you, wha needs Tories? Anither braw airticle Tammas, ye’ve hut the nair oan the heid – Scots is “the leid o the wirkin clesses”. What does this mean? Weel, maist fowk wha votit ‘Aye’ in 2014 shuirly spoke Scots an wha’d doot thon? Yet still the Scots language is not taught tae Scots bairns. It is ridiculed by mony o oor ain fowk, ignoramuses like Neil Findlay. Those who speak Scots are aye haud bak in terms of opportunity. We hire good English speakers instead, and we promote the latter to many of our top jobs as a matter of course – i.e. we often also discriminate in favour of candidates from outside Scotland itself on the basis of language. Yet are the latter really qualified given they have little or no knowledge of Scots? What is the consequence of this? Discrimination, cultural and yes racial too on the basis of blatant language oppression. If there is no majority in Holyrood willing to back a ‘Scots Language’ Bill, this means our legislators have become our oppressors. Ma apologeese fer ma awfu puir Scots! A’m wirkin on it. Ma schuil nivver taucht me ma ain leid, ma ain mither tung. Thay forfaut me ma verra ain cultur an aw ither Scots fowk tae. If Neil Findlay is half-the-man his supporters say he is, I doubt if he’ll find much to disagree with in your piece, Tammas Clark. Thanks. e ken a still cannae read a tekst in ma ain leid that easy. Ah lernt in skule that this leid wisnae “proaper! Guid on ye fir gien it a go, Hamish. Ye’ll hae the hang o it soon. Scots is mair common in scuil these deys, an is aye gettin mair acceptable. The next generation wilnae think onythin o spikin Scots whaurever they want, I doot. Findlay thought he was being clever but only advertised his own ignorance. Nae idea whit wey fowk are glamourt by him – my feeling has always been that he is a bit thick. His tweet confirms that. Sorry rab, but this is nonsense, Findlays point is clear, if ye want to take on papers who print shite then the national is one of them mate. Support for right wing papers tells ye aw ye need tae ken aboot the limits o Scottish Labour’s radicalism.